John Ford (center) turns soil at the groundbreaking ceremony for the John and Nita Ford Village at DBU. With him are (L-R) Gary Witherspoon, Lee Roy Mitchell, Dr. Gary Cook, Dr. Adam Wright, Dr. Greg Ammons, and Raymond Harris. 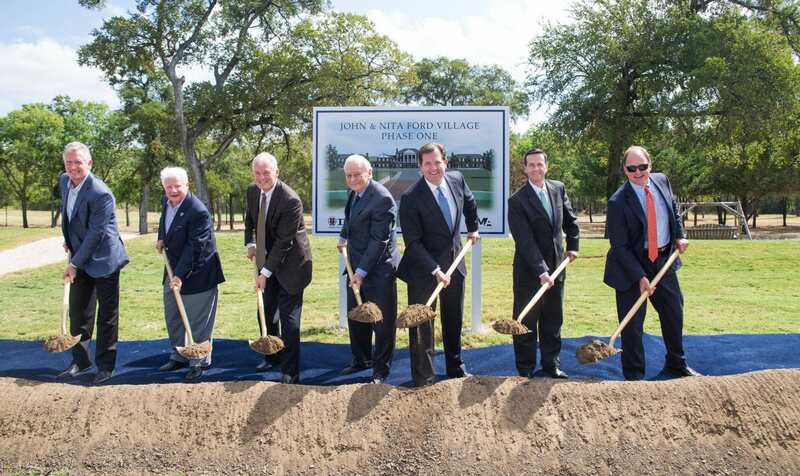 DALLAS—Recently, Dallas Baptist University hosted trustees, donors, faculty, and staff for a groundbreaking ceremony for the newest addition to University Hill, John and Nita Ford Village. The Ford Village will encompass 20 acres of land and provide housing space for some 500 future DBU students. These students will be involved in DBU’s first Residential College, an intentionally focused program for developing Christian servant leaders for a variety of vocations. Thanks to the generosity of John and Nita Ford, Phase I of the project will begin this fall and include construction of a two-lane car bridge over O’Guinn Creek to access the land and the initial buildings of the Residential College. The Fords have been long-time friends and generous supporters of the University. John Ford has been a leader in the North Dallas and Collin County business community for years and helped to establish DBU’s annual Tom Landry Leadership Award, which honors community leaders in Collin County and Arlington. His wife, Nita, has served for 16 years on the DBU Board of Trustees and has remained an active member of the DBU Women’s Auxiliary Board as well. In recognition of their years of service, Nita was honored with the Ruth Award in 2006, and John with an honorary Doctor of Humanities degree in 2011. “We could not be more thrilled that Mr. and Mrs. Ford have responded to our desire to advance the mission of DBU through the Transform Campaign. This generous gift that will serve as a catalyst to bring about the ability to accommodate nearly 500 new DBU students,” explained Dr. Adam C. Wright, DBU President. The Residential College is set to open Fall 2019, and students will be able to begin applying for the program in Spring 2019. For more information about the Transform Campaign, please visit www.dbu.edu/transform, or contact Jeffrey Johnson, DBU Vice President for Advancement, at 214-333-5759 or jeff@dbu.edu.